Description: 3 SW1500s, a GP40-2, and a slug. Too bad that our buddy Ryan left two minutes prior to this arrival. Description: Here it is again. Description: 478, 1522, and Soo Line ballast hoppers. Description: What a consist!!!! 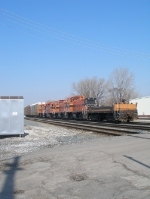 Eastbound Indiana Harbor Belt train departs East.